Looking to join VAWC as an existing co-op or form a new co-op? We’re a co-op-led support and development organization and we invite you to contact us: info@valleyworker.coop or at 413.268.5800. VAWC Members direct and determine VAWC’s mission, vision and work based on one-member-one-vote process at monthly meetings. VAWC Members contribute to the growth and strengthening of our members and movement through our Co-opreneur work. Whether it is increasing the collaboration and purchasing from existing co-ops, converting existing businesses to co-operatives, surveying demand from co-ops for new entities, or developing co-operatives on our own VAWC is a center of co-op development in our region. Co-ops are formed for many reasons and in different forms. It is important and useful to co-operate around renting or owning a home, as in housing co-ops. Purchasing co-ops benefits members through lower cost items, like in a buying club or business association. Just as important is to co-operate around what we consume, like the food we buy, where members in food co-ops have a real say. So what makes worker co-operatives unique from other types of co-operatives? Worker co-operatives are unique in that members take part in the Democratic Member Control and Member Economic Participation on a day to day basis regarding how their living is earned. To reach economies of scale, build business opportunities and make the argument for worker co-operatives to achieve wide ranging success, worker co-operatives benefit by working together. Secondary tier co-operatives like VAWC elevate the profile of worker co-ops by acting on these goals for wide ranging social, economic and political engagement for the improvement of our communities and our economy. ‘No Bosses Here – A Manual on Working Collectively‘ - by Vocations for Social Change. A 33rd anniversary re-print by Levellers Press of this perennial manual. Table of Contents includes: Starting a Collective; Decision Making; Dividing of Collective Work; Dealing with Feelings; People Issues: Hirings, Firings, Leavings and Salaries; and the movement and Social Change. Worker Co-op Tool Box from Shared Capital Co-operative: A free pdf download of a guide in which two VAWC Member Co-ops are case studies. VAWC’s Services and Needs Questionnaire – Every VAWC Member Co-op gets this form so VAWC Board and Staff can better meet needs and serve goals. Take a look. The Valley Alliance of Worker Co-operatives is rooted in the ideals of co-operation, mutuality and solidarity. VAWC is itself an expression of co-operative principles — a “co-op of co-ops” that have come together as a means of strengthening the efforts of our individual co-ops to develop their businesses, serve their members, and contribute to the wider co-operative economy. Utilizing relations among Members and Staff, VAWC serves co-ops with a variety of activities to have strong, vibrant co-ops in a system that is raising awareness and serving its membership. Start-ups, conversions and existing co-ops receive comprehensive support from VAWC staff, board and VAWC Member networks. VAWC Members receive support for legal and founding documents, mission statements and structure, hiring and expansion and more. Members are able to align the goals and activities of our shared system with their own and achieve their mission more fully. VAWC is owned and operated by its members who direct the resources and staff to meet their shared goals. Like any co-operative having engaged, informed members is key to a thriving workplace and business meant to build an intergenerational asset rooting jobs and wealth in communities. We’re unique in being a support and development organization that is run and funded by co-ops themselves and our member co-ops are key to making what we do possible. The informed participation of our member co-operatives provide the resources for supporting several conversions to worker co-ops, our Working for a Co-op Economy marketing campaign and our VAWC Interco-operative Loan Fund. Our vision of a thriving co-operative system depends on interco-operation and partnership among and across all sectors. 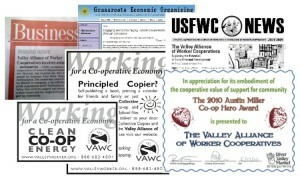 We co-founded the Valley Co-operative Business Association (VCBA), attend several conferences and are members of the United States Federation of Worker Co-operatives (USFWC). VAWC Member Co-ops receive 50% off membership to the USFWC and 25% off membership in VCBA as well as being a part of our ongoing collaboration with Neighboring Food Co-op Association and Co-operative Fund of New England. We co-create and manage curriculum with faculty, students and the Neighboring Food Co-op Association at UMass, Amherst. The CEC provides classes about co-operatives, internships and classroom visits from co-operators. VAWC Members receive a VAWC Owners Manual describing operations and history of their own co-op as well as that of VAWC. We created modules for co-operative governance, structure, marketing, co-op history, meeting facilitation and more. VAWC presents at numerous local and movent conferences, classrooms and events including the United States Federation of Worker Co-ops, the Eastern Conference for Workplace Democracy, Northeast Organic Farmers Association, Western Mass Jobs With Justice, Vermont Employee Ownership Center and more. You can read more about what we do with Education here. Our Working for a Co-operative Economy ad campaign features Members and is printed in 3 food co-op newsletters, reaching over 10,000 members in our region as well as the United States Federation of Worker Co-operatives newsletter. VAWC Members are plugged into a network of co-operatives who prioritize patronizing other co-ops with VAWC Staff assisting on marketing strategies. Using press releases and social media, web presence and online commentary, and local and movement media VAWC raises awareness of its Members and their support co-op. Here we only hope to provide a simple outline and provide resources you can access on your own. At the bottom of this page we have a short list of resources that go more in depth. A cooperative (also co-operative or coöperative; often referred to as a co-op or coop) is defined by the International Co-operative Alliance’s Statement on the Co-operative Identity as an autonomous association of persons united voluntarily to meet their common economic, social, and cultural needs and aspirations through a jointly-owned and democratically-controlled enterprise. Co-ops are based on the co-operative principles first drafted by the Rochdale Pioneers in England during the 1800′s. For a very short piece on this wonderful and insightful history click here. We invite you to contact us for more support: info@valleyworker.coop.